Wow this is an amazing deal! 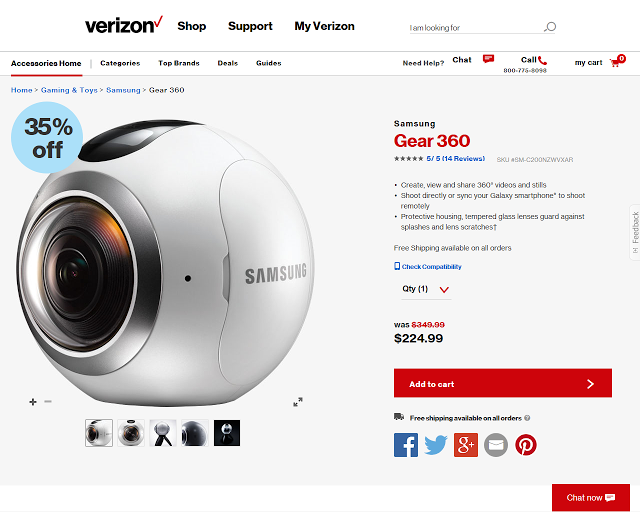 The Samsung Gear 360 for just $225 from Verizon Wireless! The Gear 360 was launched at $350, and about a month ago, it dropped to $275 at most retailers. At $225, it is the lowest cost 4k 360 camera. Is this a closeout? Could the Gear 360 Pro be on the horizon? I suspect Samsung might announce it at Mobile World Congress in February. Here is my Samsung Gear 360 wiki and resource page, with a link to my in-depth review and related posts.